After rumors circulated of a 250GB PS3 slim, Sony of Europe confirmed this to be true. The 250GB PS3 Slims will be bundled together with various hardware for about 284.99 Pounds or about 462 US Dollars. The current 120GB PS3 Slims are about 249.99 Pounds or about 405 US Dollars, so getting at 250GB for about 60 pounds more is actually a nice deal. Choosing between two Platinum titles (called Greatest Hits in the US) or get a copy of inFamous, this will be the first available bundle. Uncharted 2 bundle which will be available October 16th. Movie bundle, which includes Blu-rays of “X-Men Origins: Wolverine” and “The Dark Knight”, and a official Sony Blu-ray remote. For Australia, aside from the Uncharted 2 bundle (which comes out on October 15th for them) they can expect to get a bundle for Ratchet and Clank: A Crack in Time, SingStar Motown, and EyePet (when they are available for retail). Japan is getting the Final Fantasy XIII, which was mentioned a few earlier on Geek Montage. The bundle includes FFXIII and a special 250GB ceramic-white PS3 featuring the game protagonist, Lightning, on the top. 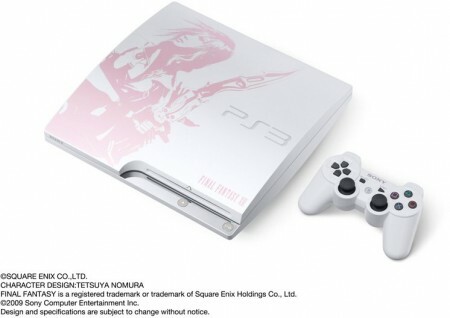 It is officially being called the Final Fantasy XIII Lightning Edition. There has no word on whether any of these sort of bundles will be hitting stateside, but there is a possibility that a special bundle might make its way to the country. This entry was posted	on Saturday, September 26th, 2009 at 11:00 AM	and is filed under Games, News. You can follow any responses to this entry through the RSS 2.0 feed. You can leave a response, or trackback from your own site.